From its winter outpost at "Low Ridge" inside Gusev Crater, NASA's Mars Exploration Rover Spirit took this spectacular, color mosaic of hilly, sandy terrain and two potential iron meteorites. The two light-colored, smooth rocks about two-thirds of the way up from the bottom of the frame have been labeled "Zhong Shan" and "Allan Hills." The two rocks' informal names are in keeping with the rover science team's campaign to nickname rocks and soils in the area after locations in Antarctica. Zhong Shang is an Antarctic base that the People's Republic of China opened on Feb. 26, 1989, at the Larsemann Hills in Prydz Bay in East Antarctica. Allan Hills is a location where researchers have found many Martian meteorites, including the controversial ALH84001, which achieved fame in 1996 when NASA scientists suggested that it might contain evidence for fossilized extraterrestrial life. Zhong Shan was the given name of Dr. Sun Yat-sen (1866-1925), known as the "Father of Modern China." Born to a peasant family in Guangdong, Sun moved to live with his brother in Honolulu at age 13 and later became a medical doctor. He led a series of uprisings against the Qing dynasty that began in 1894 and eventually succeeded in 1911. Sun served as the first provisional president when the Republic of China was founded in 1912. The Zhong Shan and Allan Hills rocks, at the left and right, respectively, have unusual morphologies and miniature thermal emission spectrometer signatures that resemble those of a rock known as "Heat Shield" at the Meridiani site explored by Spirit's twin, Opportunity. Opportunity's analyses revealed Heat Shield to be an iron meteorite. Spirit acquired this false-color image on the rover's 872nd Martian day, or sol (June 16, 2006), using exposures taken through three of the panoramic camera's filters, centered on wavelengths of 750 nanometers, 530 nanometers, and 430 nanometers. 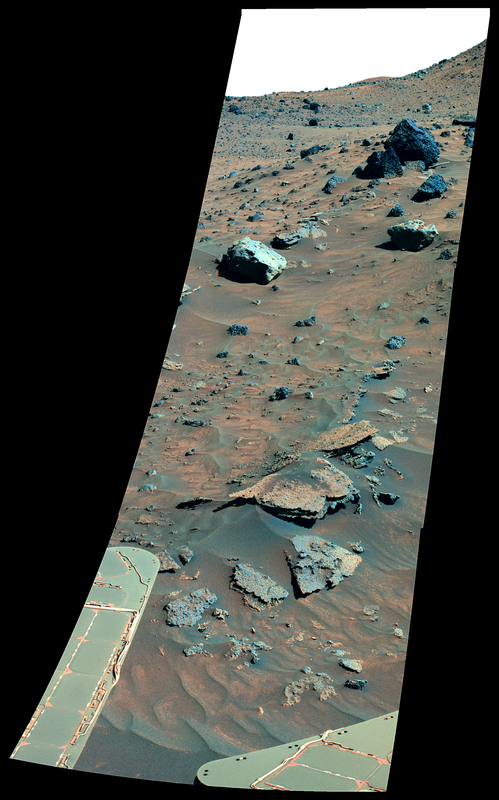 The image is presented in false color to emphasize differences among materials in the rocks and soil. Spirit acquired this approximately true-color image on the rover's 872nd Martian day, or sol (June 16, 2006), using exposures taken through three of the panoramic camera's filters, centered on wavelengths of 600 nanometers, 530 nanometers, and 480 nanometers.